The Eye's Mind - the artist and the draftsman was launched at the National Library of Australia on Tuesday, 22nd June, 2010 at 4pm. It was an outstanding success. His excellency Mr. Michael Bryce gave of wonderful talk following Merv's talk. You can find a transcript of both of these talks in the blog section of this website. Following the article in the Sydney Morning Herald, which by a shear coincidence, came out on the same day as the launch, there was a rush of sales. Almost 100 books were sold in a little over a week. "Good sound draftsmanship skills are fundamental to the human capacity to think visually"..... Merv Moriarty. Over the last 50 years Australian artist and art educator Merv Moriarty has taught thousands of artists from beginners to master class and has now combined his philosophy with practical lessons in this must-have art text The Eye's Mind - the artist and the draftsman. The hand-bound self-published book is a work of art in itself, with Merv Moriarty and his assistant Rose Constable producing each book individually in Moriarty's studio at his home on the Far South Coast of New South Wales. A beautiful gift, as well as essential text, the book is easy to understand and follow and suitable not only for art students and more experienced and skilled artists, but also art hobbyists who are looking to get more meaning from their work through developing a solid visual foundation. Moriarty says The Eye's Mind - the artist and the draftsman, addresses the need art students and artists of all ages have to transfer their creative ideas from free expressionism to perceptive visual concepts with underlying structure, and in doing so come to see the world through an extra eye, the mind's eye. Consider again the equation – E=mc2 The relationship between energy and mass is astonishing to us. How can it be that a lump of something that we could easily pick up in one hand, if turned into free energy could blow up a city block? What if we were to discover some way of comparing the mind energy potential of the reasoning human mind with intelligence in another state, perhaps as it might exist around us in everything that is our environment. In the atomic structure that maintains the rock on the hillside as a rock century after century, millennia after millennia. Perhaps hidden somewhere in the cooperating particles that form the atoms that form the first cell that divides in the ovary of the pear flower to follow the script that becomes the pear, complete with the seeds containing the script for the next pear tree. Can we connect with this other intelligence, not the one we use to tie our shoe laces or do sums, but the one that sees the connectedness between shapes and directions; the one that can see mathematical perfection between one shape and another and more than that, predict the turn in a line that will make the next mark resonate with those that went before. Yes. We can employ the high speed mathematical calculations of the eye’s mind to arrive at a shape, a position of a shape or line, a direction or proportion or any other visual relationship we might require if we connect properly with the two spheres of our mind at the same time. We can let the deeper conscious mind calculate the perfect relationship between an existing line or shape and the one we are about to make. It is like being between thinking and feeling. It takes developed skill and is out of reach to the unpracticed hand and mind. Working very quickly, too quickly to be able to see and experience form fully and depending on the body’s sense of rhythm can achieve a result that is superficially attractive, but nothing of depth or substance can be said from this position. This style of drawing is popular only because it is a current trend. Such work has the longevity potential of a pop song or the truth of the Emperor’s clothes, but thankfully we are not limited to such devices as these if we make the effort to connect with the two main aspects of our mind, the one that reasons because it can solve problems and the one that recognizes the intelligence, the mind that is in all things and is all things, because it can see beauty. We need to have our reasoning “do it mind” do what is being presented to it by our other mind and it needs to be in a form that directly relates to the mark that the artist intends to make next. And that mark starts here. Children, they that we once were, with all the burning need to draw and paint, seek to come to grips with the world they see around them by putting marks on paper. The first marks that children make are marks only, or scribble. This is not early abstract picture making as the experience for the child may be the sheer joy of seeing the line form in the wake of the pencil, or the colour appear on the paper from a loaded brush. Slowly these marks become more meaningful and at a point in the child’s development through the medium of paper and pencil, he/she becomes conscious of a particular intention and will be annoyed when the mark just made fails an expectation. We humans are always changing, more obviously so when we are children and there comes the time when we want to draw the things we see and we want to draw them convincingly. Some of us develop this skill more easily and more naturally, yet the ability to draw convincingly is not just a talent given to some and not to others, it is a product of our intelligence and our physical dexterity and like other intellectual and physical skills it can be learned. Many people say they could never learn to draw. They believe this because they expect the ability to draw to come to them packaged, ready to use, thinking they should be able to will the pencil to recreate on the paper, the vision they have of their subject. When this fails, they are convinced that they will never be able to draw. Having taught art at a tertiary level all my adult life I have found that when people are coaxed to see their subject in terms of elements like direction and proportion, which they can recreate with pencil or charcoal, they discover that they can draw. The first successes are usually minor, but the demon that was blocking their path has suffered a serious blow and can be defeated with a gradual series of successes. THIS CHAPTER IS ABOUT DISCOVERING THE (usually hidden) PRINCIPLES BEHIND OUR VISION THAT ARE CRITICAL TO OUR ABILITY TO LEARN TO DRAW. All that passes through our eyes is light. However, many complex calculations are made in our unconscious brain before we are aware of object or objects and environment. Some of these calculations involve the assessment of shapes in relationship to one another; determining such things as placement in three dimensional space and the relevance to us at the time of these particular objects in this particular space. It is important that we look at each stage of the process from light-wave to perception. 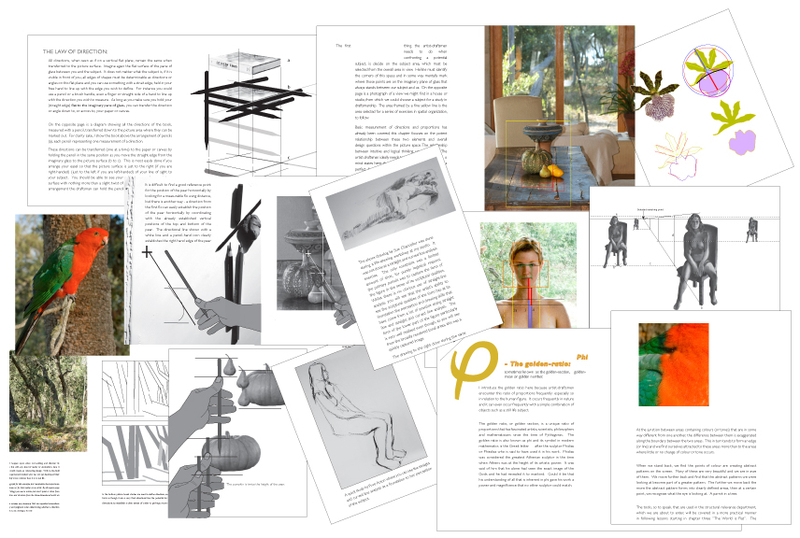 We will do this in the following pages and then look more closely at perception in all its many aspects, to determine how we might best use it as the starting point for the reforming process that is painting, drawing or sculpture based on a visible subject. Click here to read about the making of The Eye's Mind - the artist and the draftsman. 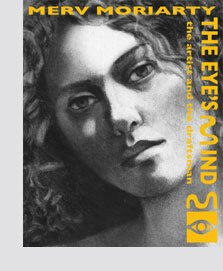 Click here to purchase your copy of The Eye's Mind - the artist and the draftsman.